The Vic Health Education Team is located in Melbourne, and welcomes members from all over Australia. The team comprises of up to 50 health care professionals, including nurses, midwives, physiotherapists, doctors, occupational therapists, dietitians and speech pathologists. All team members fund their own visit costs. Currently, the Victorian Health Education Team engages with eight major hospitals in Ho Chi Minh City, with each hospital having a specialty health care interest relationship with the team. In 2002 a group of 12 Victorian nurses travelled to Vietnam. They provided education at 2 hospitals in Ho Chi Minh City – a General Surgical Hospital and a Children’s Hospital. 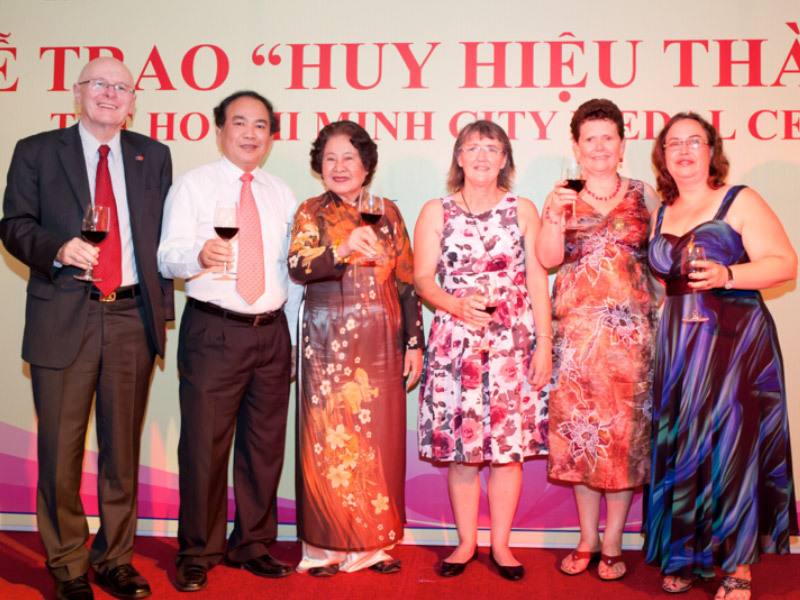 In 2003 the word had spread and this time 33 nurses travelled to Ho Chi Minh City and they visited the same 2 hospitals, Binh Dan, Children’s No1, as well as a trauma hospital and a maternity hospital, and implemented the first International Nursing Conference in HCMC. In contrast to hospitals in Australia, Vietnamese hospitals are huge. Many have in excess of 1000 beds. For example, one hospital has 1700 beds with approximately 3000 patients sharing those beds. There are often 2 patients to a bed, and patients in stretchers in the corridor. For example, Cho Ray has 1700 beds with approximately 3000 patients sharing those beds. One of the maternity hospitals had 51,000 births last year (the Royal Women’s’ Hospital in Melbourne had 6,000). Bien Vien Binh Dan – General and Urology hospital. In providing support and education, the Vic Health Education Team professionals are often surprised that even with considerable limitations (by Australian standards), the Vietnamese health providers manage to perform detailed and complex procedures. Some procedures are far more innovative than undertaken in Australia, cost limitations make for ingenious ways to solve problems. During the annual team visits, education and sharing of knowledge is done in many ways. Team members present various topics at conferences and seminars held at the various hospitals in HCMC Traditionally at the nursing conferences, it was the AVVRG team members presenting the lectures. However, in the last few years, the Vietnamese nurses have been presenting lectures as well. In more recent years the team has presented seminars in the hospitals during our visits. These seminars vary depending on the requirements of the hospitals and the expertise of the team members. Seminars topics have included – trauma nursing, infection control, burns care, Australasian triage system, spinal trauma, paediatric update, deteriorating patient, stroke management. With many skills within the health care seeing, it is not only the theory that important to learn, it is essential to be able to practise the skills learned to fully understand them. Interactive workshop sessions prove to be much more interactive and fun for both the team members and the participants. In small groups in the workshops participants are able to gain more hands on skills and knowledge. In between the seminars and conferences held in the hospitals, team members spend time in the clinical settings in the various hospitals. There are many in-services sessions given in the ward areas. The in-services may be given to large groups of nurses, or to small groups in the ward. Even the patients like to participate! Over the years we have seen many changes. One of the biggest changes we have seen is the implementation of the triage system at Cho Ray soon after the Triage Seminar and Train the Trainer. In 2009, a Chemotherapy seminar was held at Tu Du hospital and the next year, they had built a chemotherapy preparation cabinet. Our continuous planning cycle demonstrates the work that is undertaken over a 12 month cycle. At the conclusion of the 2 week education program, the leadership team evaluates the program and commence planning for the following year. Included in planning the education program, leaders identify teaching resources and equipment that may be of use for the various hospitals. The leadership team pursues fundraising activities to procure the necessary equipment to take to Vietnam on the next annual program. The Leadership Committee advertise in their hospital workplaces to recruit team members to partake in the next annual program. in view of team members specialities, the team leadership committee develops the program for the next annual education program. In September, two team members travel to Vietnam to meet with all the hospitals and formulate the individual programs as well as determine the topics for the annual Nursing Conference.On their return the annual program is finalised. With the annual program formulated, each contributing team member prepares their presentation. A written version of the presentation is then sent to Vietnam to be translated, and be ready for the audience. Team members travel to Vietnam for two weeks in January or February each year to provide education for hospital staff. Each year the education topics we are able to offer the hospitals depends on the expertise of the team members. The Health Education Team has to date been fortunate that committed health professionals have willingly given their time to help educate their Vietnamese colleagues. In return, these Team members gain a valuable insight into a very different way of life, and the sense of purpose displayed by Vietnamese health care professionals working in less affluent and (often) trying circumstances. Several social events are held leading up to the time of the trip, to enable team members to meet, and find out more details of what to expect when they are in Vietnam. While these social events are educative, they are designed to be enjoyable. We raise funds to enable us to purchase teaching equipment and resourses to take over to the hospitals. Textbooks, and other Australian healthcare publications e.g.Acorn standards. resuscitation dolls, slide sheets, pat slides. As well as equipment which we purchase in Vietnam, we also take over equipment that has been donated by Australian hospitals and medical supply companies. 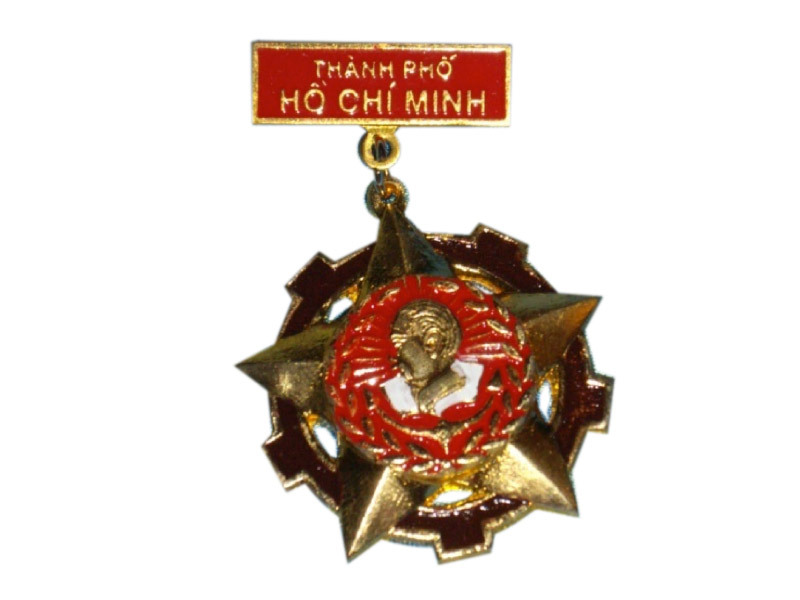 In 2010, in appreciation of our continued collaboration, two members of the team were honoured with the first HCMC Medals to be presented to non-Vietnamese people. These are very prestigious awards. In 2012, for our 10th anniversary 4 more of our team also received the award. This indicates to us that the hospitals value the knowledge and educaton we bring. Click here for the latest news from the Vic Health Education Team.